Your website/blog is your most valuable online asset. It should be a WordPress blog. This post is from our upcoming book tentatively entitled, Marketing Essentials for Small Business. The completed portions of the initial draft are temporarily available on this site via our new Free Content Library. Eventually, the book will be offered as a pdf, ebook, and in hard copy. Parts 1 and 2 of the book are also available as a downloadable pdf in the Free Content Library. They cover the first two pillars of your content marketing strategy – your website/blog and email marketing. More than 25 percent of the world’s websites are built and run on WordPress. And that percentage is increasing every day. WordPress itself says, “over 409 million people view more than 15.8 billion pages each month” on the platform. It was started by Matt Mullenweg in 2003. The platform is an open-source software CMS (content management system). That means the software is free, and it is a database driven platform. A worldwide network of developers, designers, and companies like Mobile Atom Media support WordPress. Many of these dedicated souls are continually building website themes for WordPress. And thousands of developers create “plugins” to add functionality to it. WordCamps are held yearly in cities across the globe so bloggers; developers and designers can learn even more about it. WordPress.tv has hundreds of videos covering almost every aspect of it. The site, codex.wordpress.org, has everything there is possible to know about it. If you are smart enough to invest in a blog, WordPress is the only platform you should use. Your blog houses the heart of your content marketing. It is an asset that will always be there for you. Your blog is where you establish authority and trust. Consequently, it is your most valuable online asset. It should be a WordPress blog. There are two versions of a WordPress website or blog, WordPress.org sites and WordPress.com sites. You can even add a WordPress.org blog to your existing site built on another platform. So what are the differences? A WordPress.org site uses the free WordPress software that the site owner downloads, sets up, and pays a service to host. You have complete control over it and can choose from thousands of customizable themes and thousands of plugins to get the exact look and functionality you want. You select your hosting service and can integrate it with your email provider. You will have to maintain the site by updating the operating software, theme, and plugins. It is the content marketing home you own. It is your house and can be as big as you want it to be. WordPress.org is what most businesses use, including ones in the Fortune 100. It is the option I recommend. Matt Mullenweg’s company, Automattic, hosts WordPress.com sites. The hosting is free. However, there are drawbacks to this. Your web address (also known as your URL) would be your website domain.wordpress.com. There are fewer than two hundred themes to choose from, and you can’t customize them. You only have the functionality Automattic provides and cannot add any plugins developed by third-party developers. It has a limited amount of storage capacity for your content. And if they want to they can run ads of their choosing on your site. This a content marketing home you rent. And it is more like a condo or apartment than a house. You can pay Automattic for additional functionality like showing your website domain.com rather than your website domain.wordpress.com and to prevent third party ads. You can also pay to have a customizable theme, extra storage space, email support, etc.. At this point, it is going to cost you what a basic WordPress.org site would. But you will not have the complete control of a WordPress.org self-hosted site. The advantage is that you do not have to maintain the site by updating the operating software and themes. If you are a small service-oriented business, a WordPress.com site can work well for you. When you have a WordPress.org site, you host it with a hosting company of your choosing. You pay for the service monthly, quarterly or yearly. The cost per month is lower if you go with the second two options. You will either use shared hosting or dedicated hosting. With shared hosting, your site is on a physical computer (a server) with other websites. With dedicated hosting, you rent a machine that is exclusive to you. Your server is in a data center, and your site is, usually, backed up on another server in a second location. There are two variants of shared hosting providers. Basic shared hosting hosts your website and not a lot more. These are the $5 to $15 a month type plans. They have varying degrees of reliability and security. They may not back up your site and have limited customer service. Many are not optimized for hosting WordPress sites. Managed hosting is an upgraded form of shared hosting and what the majority of small businesses should use. These can be optimized for WordPress, so your site loads faster and works more smoothly. They are very security conscious and backup your site. They, usually, have very responsive email support. Given how important your business is investing in a managed hosting account for $30 a month is a necessity in my opinion. It will lead to more conversions and revenue than basic shared hosting. Dedicated hosting costs run from the hundreds to thousands of dollars each month depending on the size of your site and its traffic. Most small businesses will not need dedicated hosting. Consequently, I will not go over it here. One of the main things you want from your hosting provider is speed. And when it comes to page loading times for your website you get what you pay for. Speed is incredibly important and along with your site design determines whether someone stays on your site or leaves after waiting for it to load within 3 seconds. Some people will not even wait 2 seconds. Speed is just as important as having a responsive design for your site. It is the difference between having a chance to gain them as a customer or losing them to your competition. You must use a hosting provider whose servers are configured and optimized for WordPress. This capability is a minimum requirement for having a fast loading site. You should now have a better understanding of what WordPress can do for your small business. If possible, I recommend you attend a WordCamp near you. It is a fantastic way to meet great people and learn about the world’s best CMS for small business. If there is a WordPress Meetup group in your area, check it out as well. See my Flipboard Magazine, Blog Me, for more information on blogging and WordPress in particular. We can help your small business with the WordPress solution you need to have a more successful website and a blog that drives revenue. 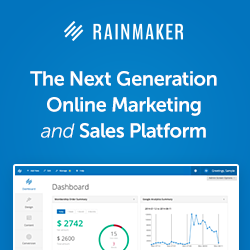 Rainmaker is a powerful customized version of WordPress. Contact me to see how it can help you sell more products and services.